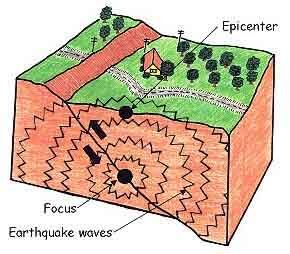 An earthquake epicenter is the point on the Earth's surface directly above the earthquake focus. The epicenter is the geographical location of the earthquake reported on television stations and written reports about earthquakes. The point where the rocks actually break is the earthquake focus. Large subduction zone earthquakes can break along a fault for hundreds of kilometer. The epicenter of these earthquakes is directly above where the earthquake actually started along the fault line. The amount of destruction at the epicenter of an earthquake is directly affected by its size and the depth where the rocks rupture. The epicenter of an earthquake is the same whether the rocks ruptured at 50 kilometers, 100 kilometers or even 300 kilometers beneath the Earth's surface. Earthquakes with a focus of less than 70 kilometers are the most destructive. Therefore when listening to earthquake reports it is important to know the geographic location of the earthquake listed as the epicenter and the depth of the earthquake. Seismologists use seismographs to study the earthquake epicenter. Using these epicenters they can discover the location of unknown faults and crustal plate boundaries. Scientists are especially concerned about epicenters of past large earthquakes in cities like Tokyo, Japan and Los Angeles, California. Both of these cities are located in major fault zones. The epicenter of the 1994 Northridge earthquake was in a large urban area and caused four billion dollars in damage. Prior to the earthquake scientists did not even know the fault existed and no small tremors gave warning of the impending disaster.